In his opening remarks, James C. F. Huang, chairman of event organizer Taiwan External Trade Development Council (TAITRA), said the robust growth in bilateral trade and investment in recent years spotlights the success of the government’s New Southbound Policy and India’s Look East Policy. These farsighted initiatives are creating mutually beneficial synergies, Huang said, adding that this positive development is expected to significantly boost Taiwan-India economic and people-to-people exchanges going forward. Echoing Huang’s remarks, Vice Minister of Economic Affairs Wang Mei-hua said trade ties are going from strength to strength. The agreements on bilateral investment and mutual recognition of authorized economic operators concluded last December in Taipei will provide greater protections for Taiwan firms eager to expand their presence in the South Asian country, she added. Indian Commerce Secretary Anup Wadhawan expressed confidence about the growth of economic exchanges, stating that his country is becoming the destination of choice for Taiwan manufacturers. 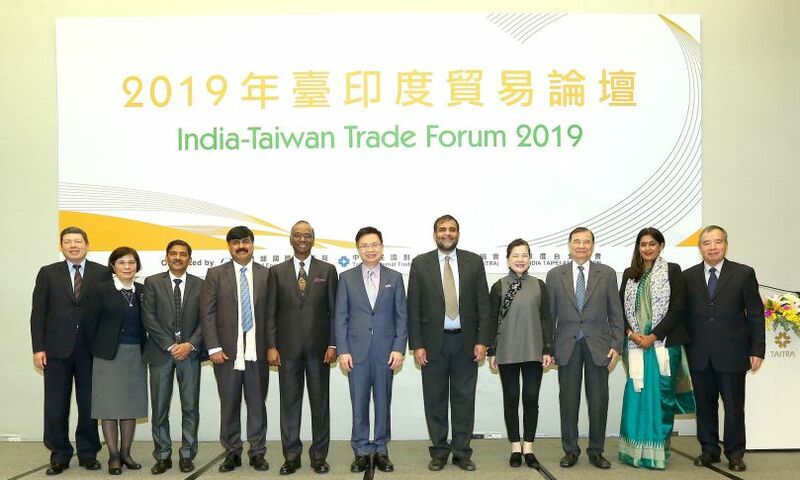 India-Taipei Association Director Sridharan Madhusudhanan added the time is ripe for Taiwan firms to tap the potential-laden Indian market given the nation’s enormous and expanding middle class. According to TAITRA, Huang is leading a delegation comprising more than 30 local companies to the Vibrant Gujarat Global Summit taking place Jan. 18-20 in the western Indian state. During the event, Taiwan firms are expected to sign memorandums of understanding with Indian counterparts on deals worth an estimated US$100 million. Official statistics reveal that bilateral trade volume grew 10.85 percent to US$7.05 billion in 2018, with accumulated Taiwan investment in India totaling more than US$600 million as of the end of last year.